Samuel grew up in Beverly, Massachusetts, and became a ship captain and merchant. His earliest experiences at sea would most likely have been as a crewman on one of the many merchant ships sailing out of Beverly or Salem. According to ship registers for the Ports of Salem and Beverly(1) he was the master of the schooner Hawke and the schooner Nancy, both registered in Beverly. (2) The published transcriptions of Customs House registers include information found elsewhere, and it is from the unspecified "elsewhere" that Samuel Haskell is connected to these vessels. Newspaper shipping notices help pinpoint when this was. The annotated ship registers are apparently wrong as to which schooner Hawke had Samuel at the helm. Samuel is mentioned with the schooner owned by Joseph Lovett, one of Samuel's wife's first cousins. By 1805 it had been sold to John Lovett, another cousin-in-law. Shipping notices indicate there were two schooners with that name sailing back and forth from Beverly to Bilbao about the same time. The Lovett-owned Hawke was undoubtedly the one under Capt. (prob. Joseph) Lovett. The ship registers list another Hawke of Beverly, 59 tons, owned by (Capt.) William Orne of Salem. It was "Capt. Haskell" who likely sailed this Hawke to Bilbao in February 1802, a few days after Lovett's Hawke. No other captian named Haskell is associated with any of these schooners, leaving it very likely it was Samuel. He brought Hawke back into Salem, 35 days from Bilbao, on 5 June 1802, nearly, or exactly, the same day as the other Hawke. He was about a week shy of his 23rd birthday, strongly suggesting this was his first trip as a ship master. Whichever vessel, Samuel would have been first mate on at least the trip immediately prior to the Winter of 1802 and a crew member for at least several trips prior to that to gain experience at sea. Samuel's co-owner of Two Brothers was prominent Boston merchant William Gray. Beginning in 1810 he sailed ships owned solely by Gray, who had developed a strong interest in trade in St. Petersburg, Russia. On the route to St. Petersburg for merchants sailing from England and the United States, intermediate stops were routine. American ships followed the Gulf Stream around the top of the Atlantic Ocean and passed into the North Sea between the Orkney and Shetland Islands of Scotland. Passing through Scandinavia, the route took them along what was contemporarily called The Belt (Danish: baelt). This comprised what is now called, north to south, the Samso Baelt, Storebaelt (Great Belt), Langelandsbaelt and Fehmarbaelt. Samso, Langeland and Fehmar are islands. Helsingor (contemporarily called Elsineur or Elseneur), Denmark, was often the first stop for merchant ships. To the east is the Baltic Sea, and at the far eastern end of that is St. Petersburg. Ships would stop at Kronstadt (contemporarily Cronstadt) Island about ten miles west of St. Petersburg to conduct business in addition to the latter city. On the way back home, more business was often done at Goteborg (contemporarily Gottenburg or Gottenburgh), Sweden. The Napoleanic Wars made this trip risky. European and Scandanavian countries were tangled in conflict between 1802 and 1814. When Samuel Haskell sailed into the area in 1810, Sweden was an unwilling participant in an embargo against England (called "The Continental System"), forced into it when they lost a war with Russia. Russia was an ally of France, and Napolean was pulling the strings of international trade in Europe, theoretically, but the Swedes ignored the embargo. A safe haven for English ships could be found in Hano Bay along Sweden's southern Baltic coast. English battle ships served as convoys to guide large fleets of merchants through the area and they convened at Hano and Goteborg. Although the neutral Americans were, on paper, free to trade in Baltic ports, they were not necessarily safe from harassment by the Danes. After the war, the United States held Denmark accountable for American merchant shipping losses. Samuel captained William Gray's ship Lucia, 310 tons, sailing out of Boston about 13 June 1810. (3.1) They arrived at Kronstadt Island on 10 August, probably after an unreported stop at Helsingor, Denmark, given the travel time. (3.12) Lucia came back into home port on 6 December, having sailed from St. Petersburg on 29 September, Hano on 16 October and Goteborg on 2 November. (3.2) St. Petersburg is inaccessible to ships in the winter, and it was in May that Lucia sailed again for Russia. The events during this trip caused newspaper reports to give details about it and provide a good insight into what Samuel experienced when he sailed this route, both typically and not. Lucia left port again on 25 May 1811. After what was described as a "fine passage" of 27 days, which was relatively quick, he arrived at Helsingor. (3.21) By 3 September Lucia was in Kronstadt and in St. Petersburg by 18 September, when the ship would leave for home "in a few days. "(3.22) That didn't happen. The ship made another stop at Kronstadt and was there until 5 October. The logbook of Lucia states they left the port of Matvik (often anglicized to Matwick and Matwyk) on Hano Bay, Sweden on 9 November. One hundred thirty four ships attempted to leave there under the watch of the English naval ship St. George on 1 November, but bad weather drove them back. Winter weather was setting in and they were in danger of getting caught in ice. They had to leave. The unusual part of this trip came next. The fleet stopped and anchored in the far southern end of the Baltic Sea on the night of 10 November. They sailed again for two days, but an undeniable head wind made them anchor again on the night of the 12th in the Fehmarbaelt, near the town of Nysted on Lolland Island. They were still there on the 15th, when a severe storm from the southwest blew in at 10:00 at night. It caused the anchor cables of some of the vessels to snap. Pushed out of control across the water, they got tangled with other anchor lines which then broke. Twelve boats went ashore at Lolland Island. Two crashed into each other and sank. About 12 were damaged enough that they were thought to be a loss. Thirty (Capt. Haskell thought eighteen) made their way back to Matvik safely, although with damage. The gale would have assisted them after they were free of the other boats and it had done away with their anchors, given the wind direction. The next morning Capt. Haskell found St. George in shallow water at Lolland. It was an old and poorly designed ship, so when another boat broke through one of the battleship's anchor cables, there was little to prevent it from eventually being pushed into the Lolland coast. The rudder was smashed. The masts were cut down in an attempt to prevent going ashore, but it didn't help. "Jury masts"(3.24) were built along with a "Packenham" rudder. When the weather finally allowed it, St. George and the 76 (about) seaworthy vessels of the fleet continued to Vinga (also called Wingo) Island west of Goteborg on the 17th, with help from more naval vessels stationed in "The Belt." They reached Vinga on 2 December. It was thought safe to sail again on the 18th of December, this time with more English naval ships. HMS Victory was among them, the same that had become famous under the flag of Horatio Nelson about six years earlier. Three convoys were created, one with Victory and five other naval ships, one with three more such ships including the disabled St. George under tow. The third was a fleet of merchant ships, Lucia included, escorted by the battleships Hero, Grasshopper, Egeria and Prince William. Unfavorable winds made Admiral Samaurez of Victory to signal a return to Vinga, but the other convoys continued. When entering the North Sea, the merchant convoy divided. Egeria and Prince William headed for Scotland with some of the merchant ships, Licia among them, while the others probably were aiming for London and the English Channel. By the 23rd the weather went from bad to worse. St. George was probably not as seaworthy as thought, not having been repaired since the initial damage to it in the Baltic. Duty led one of the escorts to stay with St. George even when bad storms made their situation continually worse. Both ships were wrecked on the Danish coast on Christmas Eve with the loss of most of their crews. The merchant convoys continued on across the North Sea, unaware of the disaster. Those who bore north experienced heavy gales, but the others ran into the same scenario as St. George's group along the Danish and Netherlands coasts. By 23 December their fleet had been scattered by gales. The naval ships were left escorting only 18 merchants. The rest of them were fortunate to have either been blown off track or to have headed for Scotland. Hero was blown onto the coast of the Netherlands, also on Christmas Eve, with the loss of the the convoy and most of their crews. The Lucia logbook says that on Christmas Eve it was in the North Sea between Naze and Fair Isle. The Naze is part of the most southern coast of Norway. Another merchant ship in the fleet was Isis, which is said to have passed Lucia and William & Jane on the 20th. This was before they entered the North Sea. The captain of Isis also said he spoke to Capt. Bunker (of William & Jane) in "the Sleve" on the 25th. The term "sleeve" is used to describe the English Channel, but Capt. Haskell used it to describe an area near the Danish baelts. In this case it was most likely the Firth of Forth in Scotland. Egeria's port of call was Leith, on the Firth, and it was there by the 28th. It also confirms the the American ships - at least four of them - went all the way to the Scottish coast before heading north to Fair Isle. They were by Aberdeen on the 26th, when Lucia was at latitude 57 and saw the American ships Zodiac and William & Jane, and Isis and Lucia are known to have passed Fair Isle on the 30th, and on into the Atlantic Ocean. Capt. Hilliard of Isis said he had headwinds for 10 days after leaving Goteborg, which covers nearly all the days they were in the North Sea. Other merchant ships in the fleet, when their logbook excerpts appeared in newspapers after they returned, said they encountered gales. Luck and skill probably enabled them to escape without damage and make it home with their cargo. Rubicon headed back to St. Petersburg about 18 March 1816. Ten days later they were east of the Grand Banks off Newfoundland. At 10:00 at night (not a lucky hour for Samuel at sea) the ship, going about 6 1/2 miles an hour, struck an ice berg "apparently no larger than a longboat," a longboat being a large rowing vessel. The stem was broken off. The stem is described as "part of the physical structure of a wooden boat or ship that gives it strength at the critical section of the structure, bringing together the port and starboard side planks of the hull." The ice also stove in planks on the starboard side, broke nine of the vertical timbers on that side that provide the frame to which the planks are attached and two others on the port side. All of the planks in the hull were at least loosened by the impact if not crushed. This kind of damage was potentially catastrophic. The crew went below and found water pouring in. The sails were furled and pumps activated. The bow needed to be raised and after some consideration, the crew started purging the front of the ship of its heaviest items, including the main bow anchor, another smaller anchor and a cannon. A difficult decision was made to open the forward hatch and sacrifice about 40 tons of cargo intended for sale in St. Petersburg. Among the goods set adrift were oil, wine, sugar, rice, bark and madder. The crew fashoned a buttress from a pine plank and wedged it between the deck planks and what was left of the hull to prevent a worse implosion. This was enough to allow one of the pumps to keep up with the leak. An English brig heading for Liverpool from New Orleans was hailed and the captain agreed to stay with Rubicon while the crew tried to stablized it. They set sail and found the ship at least temporarily seaworthy, leaving the brig to resume its course. On 2 April the ship Ann Maria, bound from Liverpool to New York, appeared and the captain, Isaac Waite, came on board to see how he could help. Meanwhile the crew spotted "12 or 13 pieces of field ice" around them. Waite agreed to sail with Rubicon until Samuel had a chance to have "a fair trial of the ship's bow." They were headed back to Boston. Isaac Waite would later be publicly congratulated by his passengers on two different occasions for getting through treacherous stretches of ice bergs. An unfortunate schooner, which sailed from Russia in company with Rubicon, encountered such terrible weather that it took about 3 times longer to get to New England, and the vessel was, in the meantime, assumed lost. Samuel Haskell took Rubicon to St. Petersburg for the last time about 9 April 1817. (3.36) He intended to leave Kronstadt for Boston at the first good wind on 15 July. (3.37) There was a stop at Helsignor and the ship was back in Boston on 4 September with tallow, sail cloth, iron, ravens duck, flems, sheetings, feathers, bristles and more. (3.38) At this point Samuel apparently retired from his life at sea. He was 38, had undoubtedly made good money in the St. Petersburg trade and continued to do so as a ship-owner. Although the details of his relationship with his wife Peggy aren't known, it's easy to imagine her pleasure in Samuel retiring. He went to sea several weeks after their daughter Mary Anne died of epilepsy in 1815 and their son Samuel had died while his father was most recently at Kronstadt. They had three surviving children aged 9, 8 and 1 year. 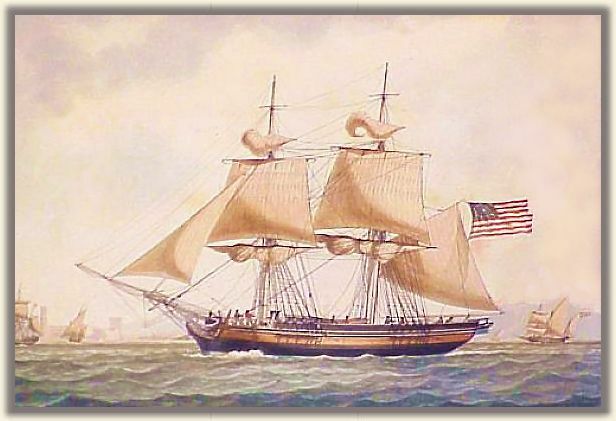 Samuel was owner of the brig William, 200 tons, registered in Beverly on 26 November 1816 and was reported in Fort Royal, Martinique, the following April. (4) Nathaniel Haskell, probably his brother, was the master. Their father owned at least of share of a ship with this name. Samuel apparently was still a co-owner in 1822, when a shipping notice says that it arrived with "hemp, iron, tallow and manufactures." A Mr. Woodbury was master. ()(The Haverhill Gazette, 1 October 1822, p. 3) It was probably William again that brought in goods for Samuel which he offered for sale at Whittredge's Wharf in Beverly in January of 1821. William had arrived in Beverly from Russia on December 16th with iron, hemp and "manufactures. "()(The Essex Register, 20 December 1820, p. 3) Samuel also had in interest in goods imported from Russia by the brig St. Clair in 1818,(4). They were 200 tons of "old sable iron," 200 bolts of "best Russian duck," 200 bolts of "Ravens, thick and thin," 40 bolts of "half duck," 10 bags of "the best feathers" and a few casks of "prime bristles." Josiah Lovett, yet another of Samuel's wife's cousins who was a ship captain and merchant, also had an interest. Samuel recieved a bale of isinglass on the ship Bramin from Russia()(Boston Weekly Report, 6 November 1819, p. 3) and coffee on the schooner Two Sisters from Santiago, Cuba, in 1823;()(The Haverhill Gazette 15 April 1823, p. 3). He may have been co-owner of a boat named Hope, 30 tons, which was sold in Salem in 1818. ()(The Salem Gazette, 10 April 1818, p. 3). The latest record found of Samuel's maritime activity is connected with the brig Rajah, registered in Beverly on 1 August 1818. (5) He was one of six owners. Rajah was about 90 feet long and 25 feet wide. It was reregistered at Beverly on 16 September 1822. Rajah, watercolor by Antoine Roux, Jr.
On what was likely her maiden voyage and near the Western Islands (Azores), a "small piratical hermaphrodite brig" overtook Rajah, where she was boarded and robbed of $1,200.00 in specie and other items. (5.25) Rajah continued to Gibraltar. Newspaper reports differ as to her route. She was in Gibraltar on 23 July, supposedly having come from Sumatra and on her way to Marseilles(5.5), but this was likely a reverse of the facts. She arrived back in Beverly on 30 August 1820, 134 days sailing from Sumatra with a cargo of pepper. (5.6) Another report said she was heading for Calcutta, which was either a mistake or an intermediate port for trade. (5.75) In any case, when she was cleared to sail in August 1818(5.8), her destination was the East Indies. However, after nearly a year out of home port, it is likely that she had been trading somewhere by the time she reached Gibraltar in July 1819, but it seems extremely unlikely she made four passes around the Cape of Good Hope and through the Indian Ocean on one voyage. Samuel is called a merchant in his obituary and his estate papers and he made a very good living probably from the income from the shipping trade. More can certainly be said of the lucrative pepper trade, but it isn't known yet specifically what the nature was of Samuel's mercantile activities other than the import of dry goods. Nothing has been found to suggest he had a store. An inventory of his household belongings show a family that enjoyed moderate wealth, but he had also accrued massive debts, leaving his estate insolvent. He never bought a house. At the time of his death, he was paying house rent to Livermore Whittridge. Among his assets were accounts due for goods brought into Beverly on the brig Homer. This ship was primarily in the Sumatra pepper trade. He still had an interest in goods shipped on Rajah, having a one sixth share in ownership. His executor sold that share, which added to the estate's assets. He was also due payment for goods on the ship Factor, of which he had a sixth share. Factor sailed to many ports in the world, with no apparent trade specialty. His estate inventory included a 3/10 share of a schoolhouse on Washington St., Beverly, a share in the #2 social library and 4 pews in "Reverend Mr. Oliphant's meeting house." This was the Dane Street Congregational Church. Peggy's death is recorded in the records of that church. The baptism and death of their first daughter named Mary Anne are found in the First Parish Unitarian (Congregational) Church records. The epitaph on his gravestone is taken from the last verse of Isaac Watts' hymn 40 and a verse in "How Are Thy Servants Blessed, O Lord" by Joseph Addison. It is carved on a white marble stone that has weathered to a point where those inscriptions are difficult to read. His and Peggy's stones were surely in the old Hale St. portion of Central Cemetery with two of their children. They were moved to or next to the Ellingwood plot in a later section of the cemetery. vital records sources: Samuel's birth, marriage and death records come from the Beverly vital records. The latter cites the Second Congregational Church as another source for his marriage. His death is also recorded on his gravestone in Central Cemetery, Beverly, and was reported in the Salem Gazette (1 September 1829, p. 3), shown above. 1.1 Salem Gazette, 7 June 1802, p. 3. 1.2. Ibid, 2 June 1803, p. 3. 1.3. The Baltimore Patriot, 27 December 1803, p. 3. 2. Ship registers of the district of Salem and Beverly, Massachusetts, 1789-1900 [hereafter SRDSB], comp. Frank A. Hitchings, etc. (Essex Institute, Salem:1906), p. 80 and p. 129 (Samuel Haskell mentioned as a master, no specifics given, original registers should be checked). 2.1. Salem Gazette, 11 February 1807, p. 2.15. Crewlists, Port of Salem and Beverly, MA. NARA, Northeast Region; SRDSB, p. 188. 3.1. Edward Gray, William Gray of Salem, Merchant (Houghton Mifflin Co., Boston & New York:1914), p. 105; Boston Gazette, 14 June 1810, p. 2, ship "Lucea" cleared for "St. Peters. 3.12. The Federal Republican, 7 November 1810, p. 3; The Evening Post, 9 November 1810, p. 3. 3.2. Boston Patriot, 8 December 1810, p. 2. 3.21. The Columbian Centinel, 14 September 1811, p. 2. 3.22. The Columbian Centinel, 26 October 1811, p. 2; The New England Palladium, 6 December 1811, p. 2. 3.24. The same as "jury rigging," which was a temporary solution cobbled together with available materials. 3.25. Eastern Argus, 18 Oct 1815, p. 3. 3.26. Commercial Advertiser, 30 Oct 1815, p. 3. 3.27. Boston Daily Advertiser, 23 Nov 1815, p. 2. 3.28. City Gazette (Charleston, SC), 23 Nov 1815, p. 2. 3.29. Essex Register, 20 Apr 1816, p. 3. This (Salem) paper is the most thorough in reporting the incident, perhaps due to Samuel (and perhaps members of his crew) being a resident of Beverly. 3.3. 3.31. Commercial Advertiser, 16 May 1816, p. 2, supposedly sailed on the 11th, but this was surely from a Boston paper (not yet found) dated 11 May. 3.32. New York Spectator, 14 Sep 1816, p. 1; Boston Daily Advertiser, 24 Aug 1816, p. 2. 3.33. New England Palladium, 5 Nov 1816, p. 2; Repertory, 14 Nov 1816, p. 4. 3.34. Repertory, 26 Nov 1816, p. 2. 3.35. New England Palladium, 17 Dec 1816, p. 2; Boston Daily Advertiser, 14 Dec 1816, p. 2, is less informative and says the trip was 53 days. 3.36. Independent Chronicle, 10 Apr 1817, p. 2. 3.37. Repertory, 2 Sep 1817, p. 2. 3.38. New England Palladium, 5 Sep 1817, p. 3. 3.4. 5.25. Ibid, 31 August 1819, p. 3. The brig Erie, which was in the vicinity, was to hunt for the pirates for the next month. 5.5. Ibid, 3 September 1819, p. 3. 5.6. Ibid, 1 September 1820, p. 3. 5.75. Ibid, 28 January 1820, p. 3. Left 27 November in convoy with Erie. 5.8. Ibid, 14 August 1818, p. 3. 6. Beverly Town Records. 7. Ibid, p. 377 (March 1825). 9. Ibid, p. 33 (1 April 1827). 10. Ibid, (17 May 1827). 11. Ibid, (9 March 1829).